Canning at home in a boiling water bath canner or pressure canner is the best way to preserve all your hard work in the garden each year. It’s also an easy way to support local growers and eat local all year long- even in the winter. 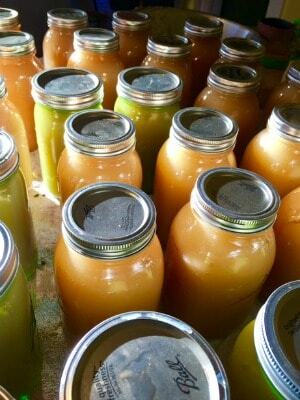 Unfortunately, many home canners make canning mistakes that can cost them their time, money, and their health. 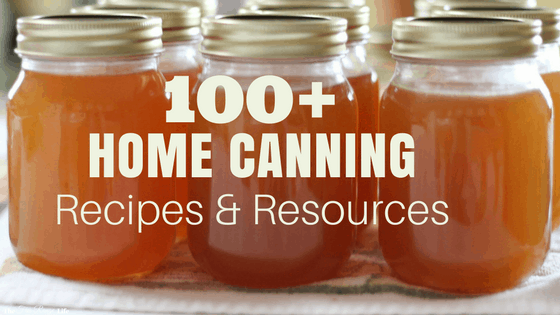 Below you will find 12 of the most common canning mistakes made by beginning home canners. Are you making any of them? This is the most dangerous mistake you can make when it comes to preserving your food. Only foods that are acidic- such as pickles, sweet fruits, and tomatoes with added acids- can be safely canned in a boiling water bath canner. All others foods must be canned in a pressure canner in order to be safe from the risk of botulism. Each home canning recipe should tell you a headspace measurement- usually 1/4 to 1/2 an inch. This is really important for you to follow. During the canning process the foods will swell inside the jars, so if you have overfilled your jars the contents will start to leak out creating sticky jars and prevent the lids from creating a seal with the rim of the jar. Underfilling your jars will leave too much oxygen in the jars and can also prevent jars from sealing correctly. Most canning sets come with a nifty little tool to help you measure your headspace accurately. Air bubbles in your jars will affect the headspace we just talked about. If you don’t pop them before placing your jars in the canner they will be pulled out during the processing time and will result in a loss of liquid during the canning process. That same nifty measuring device in your canning sets doubles as a bubble popper, so run it through your jars before placing the lids on top. 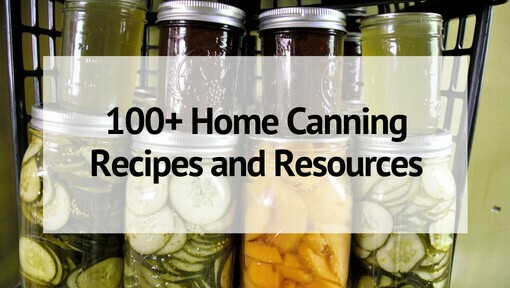 Related Reading: 100+ Canning Recipes You’ve Got to Try! Once your jars are filled and the bubbles popped you need to wipe the rim using a clean cloths. This removes any contents or residues that are on the rim of the jars. Skipping this step will prevent a good seal on your jars- which means wasted time for your or spoiled food later on. In a boiling water canner the water level must be 1 or 2 inches above the jars. The whole point of processing them in a boiling water bath is to heat the contents of the jars to a high enough temperature that all botulism spores or bacteria are killed. Covering the jars with enough water ensure that the the contents of the jars are heated evenly from all sides. 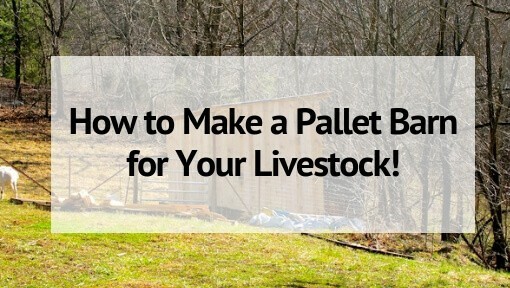 Is your goal to can and preserve enough food for your family to last all winter long? 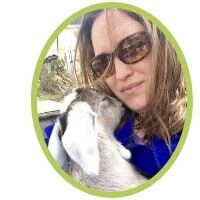 The Homestead Goal Planner is a great tool to help keep you on track and making progress toward your ultimate homesteading goals! Unless you are using lids that are specifically marked as reusable (such as Tattler) they are only one use lids. On the underside of each lid is an adhesive ring that wears out with use and they are only safe for one use. Again reusing them will create an unsafe or failed seal. Feel free to keep the lids for other uses and storage, but don’t count on them for canning. On the flip side, reusable lids are a bit different in how they work, so read the directions well if you are using them for the first time. While this isn’t necessarily a safety issue, it will cause a lot of wasted time on your part. If you place a jar filled with piping hot contents into a pot of cold water, it will break. Same goes for dropping a cold jar into boiling water. You really don’t want busted jars in your canner- not only is is messy but you will have wasted your time prepping and wasted your ingredients. 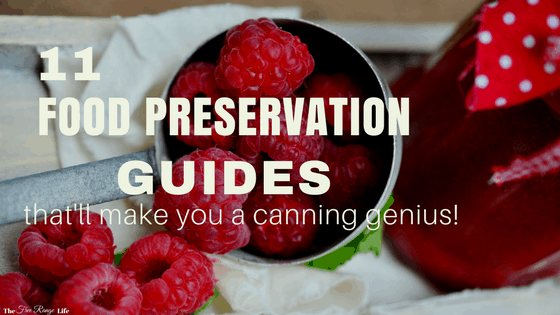 Related Reading: 11 Food Preservation Guides That Will Make You a Canning Genius! Canning jars are specifically made to withstand the heat and pressure of canning. Not all jars are created equal. Don’t reuse jars from grocery store products like spaghetti sauce, mayo, or pickles. Also be sure to check the condition of your jars before you can each year. Check for scratches, cracks, or chips. Jars with these should not longer be used for canning. Each canning recipe will tell you a processing time for your jars. The time will change based on the contents and the size of the jars. The processing times will also be different if you live at an altitude of 1000ft above sea level or higher. If you live at a higher altitude you will need to increase your processing time (water bath) or pounds of pressure (pressure canner). I know a lot of cooks that like to bake without a recipe, adding a little of this and a little of that until it comes out just right. Canning is one instance where that is not a good idea. Use tested recipes from trusted sources- such as the Ball Complete Guide to Home Preserving– to ensure the safety of your final product. For example adding extra onions and peppers to canned salsa can result in a lower acidity, which in turn can put your product at risk for botulism. Pay attention to all that your recipe tells you- the amounts, the processing time, the headspace to make sure your finished product is shelf stable. I am sure you’ve heard the saying You get what you pay for. This goes for canning to the quality of your finished product depends on the quality of the produce you put in. 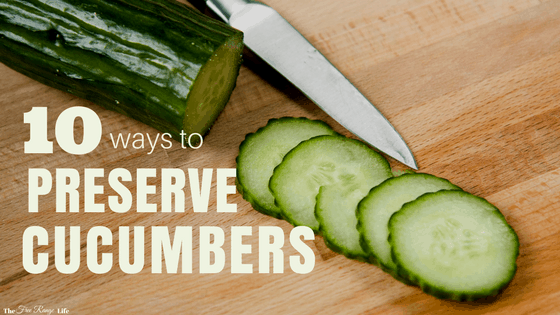 Old, softening cucumbers will not result in crispy pickles. Unripe fruits will not result in a ripe canned product. Use your best produce for canning and use the imperfect fruits for fresh eating. This final canning mistake is another big one for safety. Before you begin you want to sterilize everything- the jars, the lids, the rings, the tools, your surface. Anything that will come into contact with your jars and contents before they are capped and placed in the canner. You don’t want to risk introducing anything unsafe to your canned goods. The dishwasher does a good job of sterilizing jars- and if done just before you begin, you will also have nice warm jars to fill with hot contents (to prevent mistake # 7). A pot of simmering water does well for lids and rims. Don’t take chances- it’s better to be too clean than not enough. So, are you making any of these canning mistakes? Do you have any questions or concerns when it comes to canning at home? Leave a comment and let me know what your biggest canning problems are! I just made strawberry jam and have been a scanner for years but the jam did not set..thicken. What did I do wrong? There isn’t enough pectin in the berries. They were, maybe, not ripe enough. I would recook the batch and add store bought pectin and re-can. I did freezer strawberry jam this year and when it failed to set I called the 1-800 number of the company. The advisor said that because this year was unusually wetter than most, our strawberries had a higher water content. I guess if your cooked jam was cooked longer, there would have been more evaporation. I am not a fan of freezer jam, but if I did it again, I would probably use less fruit. Even if it is watery, it makes a great sauce. you probably did not use the correct amount of sugar or pectin. jams need to be done exactly as printed. also not alot of the juice. I made 2 raspberry jam batches, one with Certo and one with powdered pectin. I didn’t read the directions on the powdered pectin correctly and added it at the wrong time making that batch syrup, which is just fine for pancakes and ice cream. Perhaps your fruit was too ripe. Have about 1/4 the berries be slightly underripe — underripe or “green” fruit has more natural pectin in it than fully ripe berries. (You can do some research about it to verify). The perfect fruit for preserving is “fully” ripe but not “dead” ripe. The most generally accepted answer is 12 months from the date of canning. I know lots of people that will keep them much longer though. pickles, and pickled veggies can have a 4 year shelf life, if stored in the proper area. not in a sunny place or freezing place. i have mine in my attic and some in a metal closet in the attic. it stays fairly warm and cool place to store them. they have been fine there for 4 years. some longer. Another mistake is believing that you can “can” food in the oven instead of a pressure cooker or boiling water bath. There are sites that promote this very dangerous method. This can lead to a false sense of “safety” since the lid adhesive will melt in the oven and appear to “seal” the jars. The jars can break and explode if used in the oven with lids on, due to pressure build up. The temperature inside the jars will not reach the desired temperature to kill botulism spores. Please do not “can” anything in the oven!! 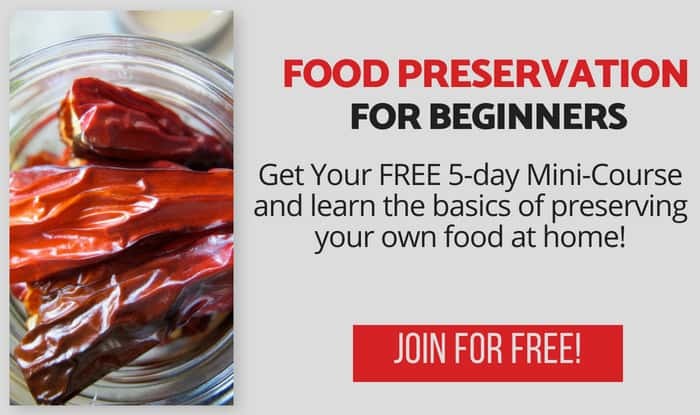 Read the canning information on the National Center for Home Food Preservation site @nchfp.uga.edu/how/can_home.html first, this will prevent a lot of tragic and expensive mistakes. I wonder why that was a method recommended and used during WW2. People successfully used that method! My mother in law is from that era and canned successfully. I was taught traditional canning from my mom. I did try oven canning and loved it for certain foods. 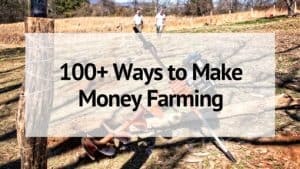 For over 37 years, I have used that method and have not ever lost produce, jars or people! Do I feel like I am taking a chance? No! Of course ensuring safety methods such as proper canning techniques, hot packing, processing 7 jars at a time and and oven thermometer is a must. Oven canning worked at one point in our history…and still does! rack. Heated lids should be placed and tightened one by one as the jars are removed from the oven. Thank you for giving excellent canning tips, I am amazed at all the stuff out there that could kill an entire family because instructions are not followed. I canned tomatoes using a pressure canner, filled with the right headspace. When removing them from the canner, the jars had much more head space. How can I correct this? As for tomato juice, it separated how can I correct it? these are great tips for the novelist in me. I am very new to canning and have probably made every single mistake there is! 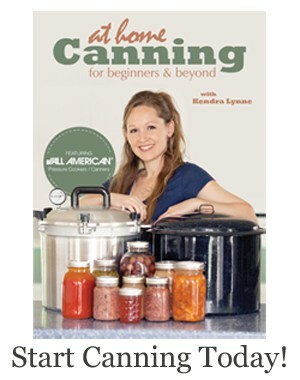 Im just learning about canning and one concern I have is needing to use a recipe. My health prevents me from eating a lot of ingredients in canning recipes like certain sugar or flour. How do you convert recipes so that it’s edible if you have a food intolerance? You don’t ever can a recipe with flour. Except to set some jams and jellies sugar is not necessary either. I would like to know why my blackberry jam is crystallizing? Followed directions?? You do not need add salt.when canning. What about the pic with jars upsiupside down? Some people cook the jelly/jam and put in jars. They follow all the correct canning practices to this point. They then flip the jars upside down and leave them sitting like this for awhile. I always use the water bath method and do not know how safe the flipped seal method would be. I made mistake #5. Now what? The lids don’t have a bump that can be depressed, but I don’t want to take a chance. I have canned tomatoes for years. I split a can of tomato juice between the 7 jars add 1tsp sugar and 1 tsp salt. Fill with tomatoes and hot bath for 45 minutes. Never had an issue, but reading this info concerns me. I canned dill pickles. The directions were to keep the completed canned pickles refrigerated for two weeks. Then they could be stored in the pantry. Once they were stored in the pantry the jar became quite clouded after a couple weeks. They were fine refrigerated. What caused this? My MIL canned dill pickles this way for years. She said they always turn cloudy then clear up. I don’t like dill pickles so I don’t know how they tasted. I have been trying to can carrots and potatoes (not in the same jar). They come out much too soft. Is there any way to can these to items and have them stay firm enough to hold up to cooking in, say, a stew later in the year? The ones I have canned have literally dissolved when opened and used. Even though it is not recommended to use a water bath for green beans, mother ALWAYS did. I didn’t know about pressure canning until I was an adult and canning myself. She boiled the canner a long time. We never got ill and I know for a fact some were on the shelf for years. We’re we just very lucky or is there a secret to it? You got lucky. Boiling them for longer in the water bath wouldn’t make a difference, because it can only get up to 212 F (the temp of boiling water). In order to actually kill any botulism spores, the contents must get up to about 245 F for a certain amount of time (varies by produce). If any spores are left in a low-acid food, they’ll start producing the toxin. Apparently, food with the toxin might be made safe by thoroughly boiling it before eating, but they don’t actually know how long it takes to render it safe, so it’s better to just use a pressure canner and follow the directions. People have died because of improperly canned food. My grandmother and my mother water bath canned green beans. When serving them they always boiled them for 20 minutes. This apparently was supposed to kill any bacteria in them. No one ever got sick, so apparently it worked. My peach jam didnt seal, what can I do, can I reheat peach’s or what? Just finished hot bath for canned brussel sprouts. Do I refrigerate or just put on shelf? How do I find out what our altitude is? Also, I canned pear preserves in tiny canning jars. They had a mildue on the tops of the pears after just a few days. The jars all popped and appeared to be sealed. What caused this? You must have used something metal to put the lids on. I canned applesauce one year and used metal tongs to take my lids and rings out of my Esther bath and they mildewed the same way. Made chicken broth, sterilized everything, broth still hot, placed the lid on jar, they all pop, saying they were sealed. After the jars were cool, placed in the refrigerator. Is it safe to drink after a month. Thanking you in advance! Is it safe to sterilize my jars in a hot oven rather than the dishwasher or boiling water? I made pepper jelly many times last year came out great! I made 2 batches this year and both times they never jelled. I used the same recipe as I did last year & followed the directions exactly as I did last year I have no idea what happened & can these batches be saved in any way? I am assuming you used pectin? Pectin can be fickle sometimes, and if you over or undercook or use the wrong amount of sugar it can affect its jelling. You can recook the jelly with more sugar, pectin, (and lemon in most cases) and try again. Sometimes it will eventually set…. I am new to all of this. I started making Freezer Strawberry Jam last year. Some of the jars the strawberries clearly rose to the top of the jar leaving the bottom of the jar with just the syrup. I stirred it when using it but wondered what would cause that. It didn’t happen on all of the jars but maybe on 1/3 of the jars. I would appreciate any incite you might have on this. Thank you.